So this kid busted his bike chain near my house the other day. He was sitting by the curb, crying. (He couldn’t have been older than 10 years old.) I offered to help him fix it and man…that chain was so full of grit and cat hair and…I don’t know what else. It was bad. I said to him, “Look, kid, you gotta clean this chain now and then.” Apparently nobody told him this. I blame his parents. They’re too busy showing off their SUVs and home improvement projects to teach the kid how to take care of his bike. Well, readers, in case you had parents as bad as this kid’s I’ve got some advice for you: Clean your bike chains already! A dirty, grimy, gritty bike chain wears out more quickly. It also becomes rigid and doesn’t shift as well, which is what caused this kid’s chain to break. 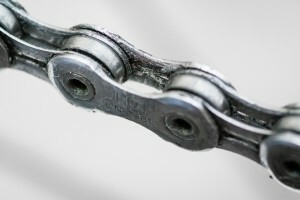 So clean those bike chains once and a while! Better yet: clean them once a month or every 100 miles. So sayeth Jack, Lord of Bike Jax. 1. Brush the dirt, bits of sand and pet hair out of each link. 3. Us the rag to wipe away the excess lube. And ba-da-bing! You’re done. Now go hit the trail.